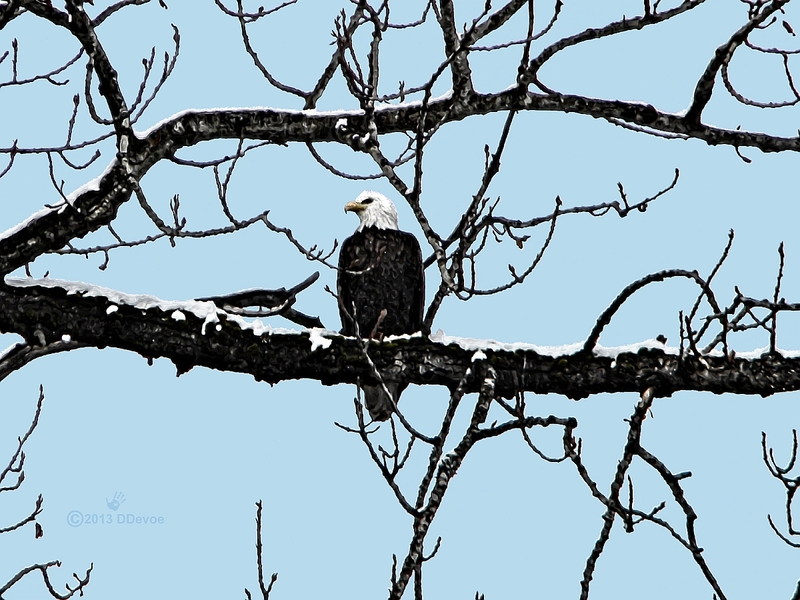 A Bald Eagle scans for prey from its perch, snow-covered branch of a Cottonwood tree. Multiple versions of this image are available at My Zazzle store. 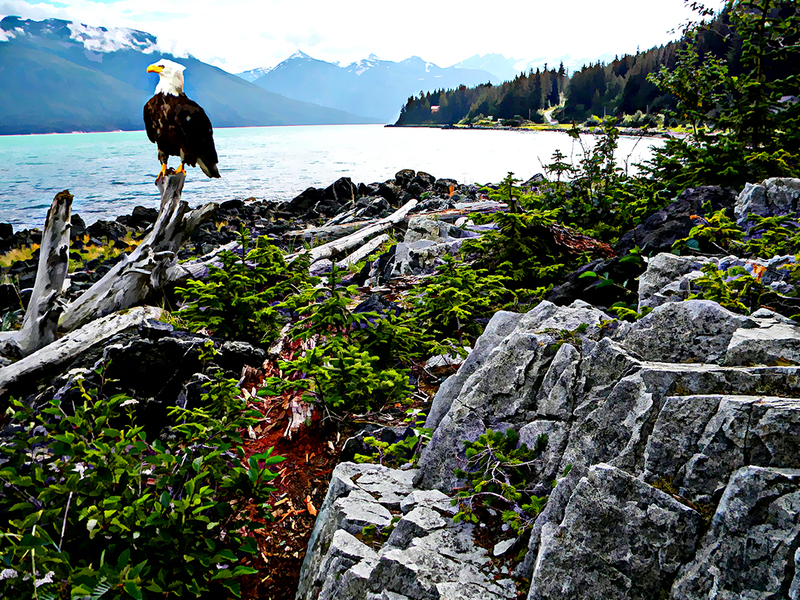 The Bald Eagle, as the only sea eagle endemic to North America, can truly be said to be the All-American bird. Its range includes most of Canada and Alaska, all of the contiguous United States, and northern Mexico. If its territory has access to open water, it remains there year-round, but if the body of water freezes during the winter, making it impossible to obtain food, it migrates to the south or to the coast. The Bald Eagle placed in the genus Haliaeetus (sea eagles) gets both its common and specific scientific names from the distinctive appearance of the adult’s head. The scientific name is derived from Haliaeetus, from Greek hali = salt/ocean, aeetus = eagle, and leucocephalus, Latinized Ancient Greek for “white head,” leuco = white, cephalis = head. Bald Eagles are powerful fliers, and soar on thermal convection currents. They reach speeds of 35–43 mph when gliding and flapping, and about 30 mph while carrying fish. Diving speed is between 75–99 mph, though they seldom dive vertically. An eagle’s eye is almost as large as a human’s, but its sharpness is at least four times that of a person with perfect vision. The Bald Eagle is an opportunistic feeder subsisting primarily on fish, which it swoops down and snatches from the water with its talons. It builds the largest nest of any North American bird and the largest tree nests ever recorded for any animal species, up to 13 ft deep, 8.2 ft wide, and one metric ton (1.1 tons) in weight. The Bald Eagle’s call consists of weak staccato, chirping whistles, kleek kik ik ik ik, somewhat similar in cadence to a gull’s call. The Bald Eagle typically requires old-growth and mature stands of coniferous or hardwood trees for perching, roosting, and nesting. Tree species is less important than the tree’s height, composition and location. Selected trees must have good visibility, be over 66 ft tall, an open structure, and proximity to prey. Perhaps of the paramount importance for this species is an abundance of comparatively large trees surrounding the body of water. Mammalian prey includes rabbits, hares, ground squirrels, Raccoons, Muskrats, beaver, and deer fawns. Newborn, dead, sickly or already injured mammals are often targeted. However, more formidable prey such as adult raccoons and sub-adult beavers are sometimes attacked. Together with the Golden Eagle, Bald Eagles are occasionally accused of predating livestock, especially sheep. There are a handful of proven cases of lamb predation by Bald Eagles but they are much less likely to attack a healthy lamb than a Golden Eagle and both species prefer native, wild prey and are unlikely to cause any extensive determent to human livelihoods. To hunt fish, the eagle swoops down over the water and snatches the fish out of the water with its talons. They eat by holding the fish in one claw and tearing the flesh with the other. Eagles have structures on their toes called spicules that allow them to grasp fish. Osprey also have this adaptation. Bald Eagles have powerful talons and have been recorded flying with a 15 lb Mule Deer fawn.This feat is the record for the heaviest load carrying ever verified for a flying bird. It has been estimated that the gripping power (pounds by square inch) of the bald eagle is ten times greater than that of a human. When hunting concentrated prey, a successful catch which often results in the hunting eagle being pursued by other eagles and needing to find an isolated perch for consumption if it is able to carry it away successfully. On June 28, 2007 the Department of Interior took the American bald eagle off the Federal List of Endangered and Threatened. Bald eagles are still protected under the Bald and Golden Eagle Protection Act. The number of nesting pairs in the lower 48 United States increased 10-fold, from less than 450 in the early 1960s, to more than 4,500 adult bald eagle nesting pairs in the 1990s. In the Southeast, for example, there were about 980 breeding pairs in 1993, up from about 400 in 1981. The largest concentrations were in the states of Florida and Louisiana. Today, the largest concentrations in the lower 48 are in Florida, Minnesota, and Wisconsin. I painted this from a photo I took the day after the winter solstice. 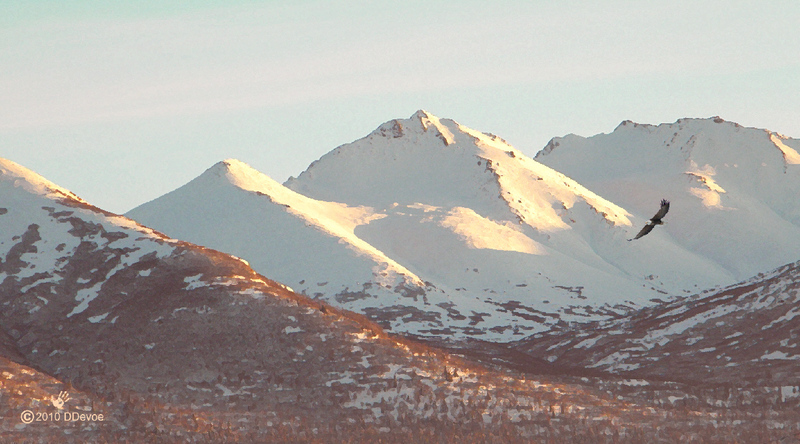 Image available at Winter Eagle.